Beginning in 1934 the concentration camps were administered by the Concentration Camps Inspectorate (CCI), which in 1942 was merged into SS-Wirtschafts-Verwaltungshauptamt , and they were guarded by SS-Totenkopfverbände (SS-TV). The Concentration Camps Inspectorate (CCI) or in German, IKL was the central SS administrative and managerial authority for the concentration camps of the Third Reich. Created by Theodor Eicke, it was originally known as the "General Inspection of the Enhanced SS-Totenkopfstandarten", after Eicke's position in the SS. It was later integrated into the SS Main Economic and Administrative Office as "Amt D". SS-Totenkopfverbände (SS-TV), literally translated as Death's Head Units, was the SS organization responsible for administering the Nazi concentration camps and extermination camps for Nazi Germany, among similar duties. While the Totenkopf (skull) was the universal cap badge of the SS, the SS-TV also wore the Death's Head insignia on the right collar tab to distinguish itself from other Nazi Schutzstaffel (SS) formations. Holocaust scholars draw a distinction between concentration camps (described in this article) and extermination camps, which were established by Nazi Germany for the industrial-scale mass murder of Jews in the ghettos by way of gas chambers. Use of the word "concentration" came from the idea of confining people in one place because they belong to a group that is considered undesirable in some way. 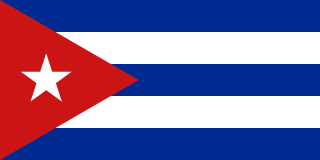 The term itself originated in 1897 when the "reconcentration camps" were set up in Cuba by General Valeriano Weyler. In the past, the U.S. government had used concentration camps against Native Americans and the British had also used them during the Second Boer War. Between 1904 and 1908, the Schutztruppe of the Imperial German Army operated concentration camps in German South-West Africa (now Namibia) as part of its genocide of the Herero and Namaqua peoples. The Shark Island Concentration Camp in Lüderitz was the largest camp and the one with the harshest conditions. Valeriano Weyler y Nicolau, 1st Duke of Rubí, 1st Marquess of Tenerife was a Spanish general and colonial administrator who served as the Governor-General of the Philippines and Cuba. 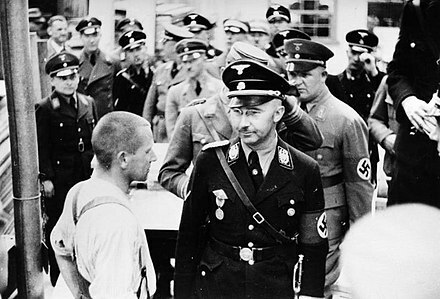 Reichsführer-SS Heinrich Himmler inspecting Dachau concentration camp on 8 May 1936. As a result of the Holocaust, the term "concentration camp" carries many of the connotations of "extermination camp" and is sometimes used synonymously. Because of these ominous connotations, the term "concentration camp", originally itself a euphemism, has been replaced by newer terms such as internment camp, resettlement camp, detention facility, etc., regardless of the actual circumstances of the camp, which can vary a great deal. After September 1939, with the beginning of the Second World War, concentration camps became places where millions of ordinary people were enslaved as part of the war effort, often starved, tortured and killed. During the war, new Nazi concentration camps for "undesirables" spread throughout the continent. 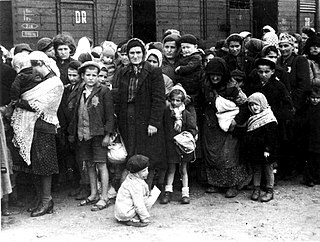 According to statistics by the German Ministry of Justice, about 1,200 camps and subcamps were run in countries occupied by Nazi Germany,  while the Jewish Virtual Library estimates that the number of Nazi camps was closer to 15,000 in all of occupied Europe   and that many of these camps were run for a limited amount of time before they were closed. Camps were being created near the centers of dense populations, often focusing on areas with large communities of Jews, Polish intelligentsia, Communists or Romani. Since millions of Jews lived in pre-war Poland, most camps were located in the area of the General Government in occupied Poland, for logistical reasons. The location also allowed the Nazis to quickly remove the German Jews from within Germany proper. 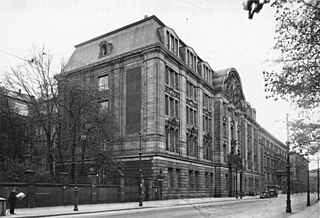 By 1940, the CCI came under the control of the Verwaltung und Wirtschaftshauptamt Hauptamt (VuWHA; Administration and Business office) which was set up under Oswald Pohl. Then in 1942, the CCI became Amt D (Office D) of the consolidated main office known as the SS-Wirtschafts-Verwaltungshauptamt (SS Economic and Administrative Department; WVHA) under Pohl. In 1942, the SS built a network of extermination camps to systematically kill millions of prisoners by gassing. The extermination camps (Vernichtungslager) and death camps (Todeslager) were camps whose primary function was genocide. The Nazis themselves distinguished the concentration camps from the extermination camps. The British intelligence service had information about the concentration camps, and in 1942 Jan Karski delivered a thorough eyewitness account to the government. 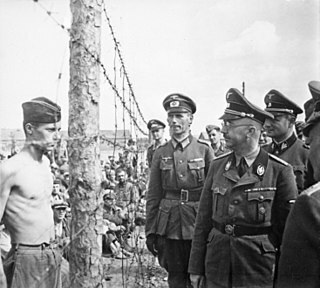 Sometimes the concentration camps were used to hold important prisoners, such as the generals involved in the attempted assassination of Hitler; U-boat Captain-turned-Lutheran pastor Martin Niemöller; and Admiral Wilhelm Canaris, who was interned at Flossenbürg on February 7, 1945, until he was hanged on April 9, shortly before the war's end. Many of the prisoners died in the concentration camps due to deliberate maltreatment, disease, starvation, and overwork, or they were executed as unfit for labor. Prisoners were transported in inhumane conditions by rail freight cars, in which many died before reaching their final destination. The prisoners were confined in the boxcars for days or even weeks, with little or no food or water. Many died of dehydration in the intense heat of summer or froze to death in winter. Concentration camps also existed in Germany itself, and while they were not specifically designed for systematic extermination, many of their inmates perished because of harsh conditions or they were executed. After 1942, many small subcamps were set up near factories to provide forced labor. IG Farben established a synthetic rubber plant in 1942 at Monowitz concentration camp (Auschwitz III); other camps were set up next to airplane factories, coal mines and rocket propellant plants. Conditions were brutal and prisoners were often sent to the gas chambers or killed on site if they did not work quickly enough. Commander-in-Chief of all Allied Forces, General Dwight D. Eisenhower, witnesses the corpses found at Ohrdruf concentration camp in May 1945. Historians have divided the Nazi concentration camps into a series of major categories based on purpose, administrative structure, and inmate-population profiles. The system of camps preceded the onset of World War II by several years and evolved gradually. Labor camps ( Arbeitslager ): concentration camps where interned captives had to perform hard physical labor under inhumane conditions and cruel treatment. Some of these were sub-camps, called "Outer Camps" (Aussenlager), built around a larger central camp (Stammlager), or served as "operational camps" established for a temporary need. POW camps (Kriegsgefangenen-Mannschafts-Stammlager / Stalag) a.k.a. Main Camps for Enlisted Prisoners of War: concentration camps where enlisted prisoners-of-war were held after capture. The inmates were usually assigned soon to nearby labor camps, ( Arbeitskommandos ), i.e. the Work Details. POW officers had their own camps (Offizierslager' / Oflag). Stalags were for Army prisoners, but specialized camps (Marinelager / Marlag ("Navy camps") and Marineinterniertenlager / Milag ("Merchant Marine Internment Camps")) existed for the other services. Kriegsgefangenen-Mannschafts-Stammlager Luftwaffe / Stalag Luft ("Air Forces Camps") were the only camps that detained both officers and non-commissioned personnel together. Camps for the so-called "rehabilitation and re-education of Poles" (Arbeitserziehungslager - "Work Instruction Camps"): camps where the intelligentsia of the ethnic Poles were held, and "re-educated" according to Nazi values as slaves. Collection and Transit camps: camps where inmates were collected (Sammellager) or temporarily held (Durchgangslager / Dulag) and then routed to main camps. Extermination camps (Vernichtungslager): these camps differed from the rest, since not all of them also functioned as concentration camps. The Final Solution or the Final Solution to the Jewish Question was a Nazi plan for the genocide of Jews during World War II. The "Final Solution of the Jewish Question" was the official code name for the murder of all Jews within reach, which was not restricted to the European continent. This policy of deliberate and systematic genocide starting across German-occupied Europe was formulated in procedural and geo-political terms by Nazi leadership in January 1942 at the Wannsee Conference held near Berlin, and culminated in the Holocaust, which saw the killing of 90% of Polish Jews, and two thirds of the Jewish population of Europe. Upon the rise of Adolf Hitler and the National Socialist German Workers Party in Germany, gay men and, to a lesser extent, lesbians, were two of the numerous groups targeted by the Nazis and were ultimately among Holocaust victims. Beginning in 1933, gay organizations were banned, scholarly books about homosexuality, and sexuality in general, were burned, and homosexuals within the Nazi Party itself were murdered. The Gestapo compiled lists of homosexuals, who were compelled to sexually conform to the "German norm". Flossenbürg was a Nazi concentration camp built in May 1938 by the SS Main Economic and Administrative Office in a remote area of the Upper Palatine Forest of Bavaria, Germany, near Flossenbürg and the border with Czechoslovakia. The camp's initial purpose was to exploit the forced labor of prisoners for the production of granite for Nazi architecture. In 1943, the bulk of prisoners switched to producing Messerschmitt Bf 109 fighter planes and other armaments for Germany's war effort. Although originally intended for "criminal" and "asocial" prisoners, after Germany's invasion of the Soviet Union, the camp's numbers swelled with political prisoners from Eastern Europe. It also developed an extensive subcamp system that eventually outgrew the main camp. Dachau concentration camp was the first of the Nazi concentration camps opened in 1933, intended to hold political prisoners. It is located on the grounds of an abandoned munitions factory northeast of the medieval town of Dachau, about 16 km (10 mi) northwest of Munich in the state of Bavaria, in southern Germany. Opened by Heinrich Himmler, its purpose was enlarged to include forced labor, and eventually, the imprisonment of Jews, German and Austrian criminals, and eventually foreign nationals from countries that Germany occupied or invaded. The Dachau camp system grew to include nearly 100 sub-camps, which were mostly work camps or Arbeitskommandos, and were located throughout southern Germany and Austria. The camps were liberated by U.S. forces on 29 April 1945. The Mauthausen–Gusen concentration camp complex consisted of the Mauthausen concentration camp on a hill above the market town of Mauthausen plus a group of nearly 100 further subcamps located throughout Austria and southern Germany. The three Gusen concentration camps in and around the village of St Georgen/Gusen, just a few kilometres from Mauthausen, held a significant proportion of prisoners within the camp complex, at times exceeding the number of prisoners at the Mauthausen main camp. The German camps in occupied Poland during World War II were built by the Nazis between 1939 and 1945 throughout the territory of the Polish Republic, both in the areas annexed in 1939, and in the General Government formed by Nazi Germany in the central part of the country (see map). After the 1941 German attack on the Soviet positions in eastern Poland, a much greater system of camps was established, including the world's only industrial extermination camps constructed specifically to carry out the Final Solution to the Jewish Question. Gross-Rosen concentration camp was a German network of Nazi concentration camps built and operated during World War II. The main camp was located in the German village of Gross-Rosen, now the modern-day Rogoźnica in Lower Silesian Voivodeship, Poland; directly on the rail-line between the towns of Jawor (Jauer) and Strzegom (Striegau). 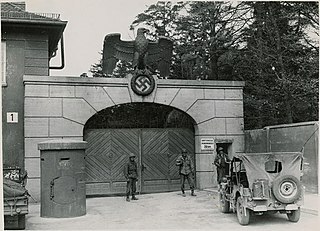 The Dachau subcamp at München-Schwabing was the first subcamp where concentration camp prisoners were permanently used as a labor force outside the main concentration camp. Unlike most of the later subcamps which were constructed, organized, and managed by the SS Business Administration Main Office (WVHA) and the Dachau camp commandant, this subcamp's construction, administration, and organization was in the hands of Eleonore Baur, also known as Schwester Pia. This subcamp was also smaller than most others, and is included here as a representative case for instances in which prisoners were used by individuals or small organizations. Kaufering was a system of eleven subcamps of the Dachau concentration camp located around the town of Landsberg am Lech in Bavaria, which operated between 18 June 1944 and 27 April 1945. 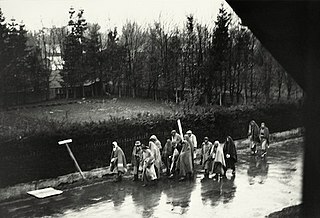 Previously, Nazi Germany had deported all Jews from the Reich, but having exhausted other sources of labor, Jews were deported to Kaufering to create three massive underground bunkers, Weingut II, Diana II, and Walnuss II, which would not be vulnerable to the Allied bombing which had devastated German aircraft factories. The bunkers were intended for the production of Messerschmitt Me 262 aircraft, but none were produced at the camps before the United States Army liberated the area. Death marches refers to the forcible movements of prisoners of Nazi Germany between Nazi camps during World War II. 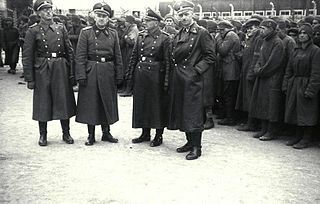 They occurred at various points during the Holocaust, including 1939 in the Lublin province of Poland, in 1942 in Reichskommissariat Ukraine and across the General Government, and between Autumn 1944 and late April 1945 near the Soviet front, from the Nazi concentration camps and prisoner of war camps situated in the new Reichsgaue, to camps inside Germany proper, away from reach of the Allied forces. The purpose was to remove evidence of crimes against humanity committed inside the camps and to prevent the liberation of German-held prisoners of war. The term subcamp in the context of Nazi Germany refers to those outlying detention centres (Haftstätten) that came under the command of a main concentration camp run by the SS within the Third Reich. It enables a distinction to be made between the main camps and the subcamps subordinated to them. Survival conditions in the subcamps were, in many cases, poorer for the prisoners than those in the main camps. 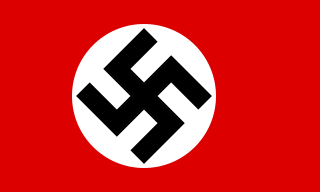 The SS-Baubrigaden were a type of subcamp of Nazi concentration camps that were first established in Autumn 1942. These units were usually made up of male non-Jewish prisoners—most were Poles or Soviets. Chances of survival were higher in these mobile units than the main camps they were attached to. The deployment of the Baubrigaden to major cities within the German Reich was the first time the German public became aware of the living conditions in concentration camps. ↑ Jewish Virtual Library (2014). "Main Concentration Camps". The Holocaust: Concentration Camps. AICE . Retrieved 17 December 2014. ↑ Holocaust Encyclopedia, Nazi Camps. Introduction. United States Holocaust Memorial Museum. ↑ Andrew Szanajda "The restoration of justice in postwar Hesse, 1945–1949" p. 25 "In practice, it signified intimidating the public through arbitrary psychological terror, operating like the courts of the Inquisition." "The Sondergerichte had a strong deterrent effect during the first years of their operation, since their rapid and severe sentencing was feared." 1 2 3 "Ein Konzentrationslager für politische Gefangene In der Nähe von Dachau". Münchner Neueste Nachrichten ("The Munich Latest News") (in German). The Holocaust History Project. 21 March 1933. Archived from the original on 6 May 2013. ↑ McNab 2009, p. 137. ↑ Janowitz, Morris (September 1946). "German Reactions to Nazi Atrocities". The American Journal of Sociology. The University of Chicago Press. 52 (Number 2): 141–146. doi:10.1086/219961. JSTOR 2770938. ↑ Henry Maitles NEVER AGAIN! : A review of David Goldhagen, Hitlers Willing Executioners: Ordinary Germans and the Holocaust", further referenced to G. Almond, "The German Resistance Movement", Current History 10 (1946), pp. 409–527. It's actually about Daniel Goldhagen. ↑ Producer, By Wayne Drash CNN.com Senior. "Army to honor soldiers enslaved by Nazis - CNN.com". www.cnn.com. ↑ "List of concentration camps and their outposts" (in German). Federal Ministry of Justice and Consumer Protection. 1 2 Concentration Camp Listing Sourced from Van Eck, Ludo Le livre des Camps. Belgium: Editions Kritak; and Gilbert, Martin Atlas of the Holocaust. New York: William Morrow 1993 ISBN 0-688-12364-3. In this on-line site are published the names of 149 camps and 814 subcamps, organized by country. ↑ "List of national socialist camps and detention sites 1933 - 1945". Germany - A Memorial. Bettina Sarnes, Holger Sarnes. So far 3600 sites are recorded on this website. 1 2 Weale 2012, p. 115. ↑ One of the best-known examples was the 168 British Commonwealth and U.S. aviators held for a time at Buchenwald concentration camp. (See: luvnbdy/secondwar/fact_sheets/pow Veterans Affairs Canada, 2006, "Prisoners of War in the Second World War" and National Museum of the USAF, "Allied Victims of the Holocaust" Archived 2014-02-23 at the Wayback Machine .) Two different reasons are suggested for this: the Nazis wanted to make an example of the Terrorflieger ("terror-instilling aviators"), or they classified the downed fliers as spies because they were out of uniform, carrying false papers, or both when apprehended. 1 2 3 Friedlander, Henry (1995). The Origins of Nazi Genocide: From Euthanasia to the Final Solution. Chapel Hill: University of North Carolina Press. p. 144. ↑ Snyder 2010, p. 416. ↑ Robert L. Berger, M.D. (1990). "Nazi Science — The Dachau Hypothermia Experiments". The New England Journal of Medicine. 322 (20): 1435–1440. doi:10.1056/NEJM199005173222006. PMID 2184357. 1 2 Lichtblau, Eric (March 1, 2013). "The Holocaust Just Got More Shocking". The New York Times. Retrieved 27 June 2014. When the research began in 2000, Dr. Megargee said he expected to find perhaps 7,000 Nazi camps and ghettos, based on postwar estimates. But the numbers kept climbing — first to 11,500, then 20,000, then 30,000, and now 42,500. For the map of more that 1,000 locations, see: Map of Ghettos for Jews in Eastern Europe. The New York Times. Source: USHMM. ↑ "Stutthof (Sztutowo): Full Listing of Camps, Poland" (Introduction). Jewish Virtual Library. Retrieved 2014-10-07. Source: "Atlas of the Holocaust" by Martin Gilbert (1982). ↑ Stone, Dan G.; Wood, Angela (2007). Holocaust: The events and their impact on real people, in conjunction with the USC Shoah Foundation Institute for Visual History and Education. p. 144. ISBN 978-0-7566-2535-1. ↑ Holocaust: The events and their impact on real people, DK Publishing in conjunction with the USC Shoah Foundation Institute for Visual History and Education, p. 146. ↑ A film with scenes from the liberation of Dachau, Buchenwald, Belsen and other Nazi concentration camps, supervised by the British Ministry of Information and the American Office of War Information, was begun but never finished or shown. It lay in archives until first aired on PBS's Frontline on May 7, 1985. The film, partly edited by Alfred Hitchcock, can be seen online at Memory of the Camps. ↑ Holocaust: The events and their impact on real people, DK Publishing in conjunction with the USC Shoah Foundation Institute for Visual History and Education, p. 145. ↑ "Bergen-Belsen", United States Holocaust Memorial Museum. ↑ Wiesel, Elie. After the Darkness: Reflections on the Holocaust, Schocken Books, p. 41. ↑ Wachsmann 2015, p. 84. ↑ Wachsmann 2015, pp. 38–45. ↑ Federal Archives (2010). "Police prison Camps and Police Prisons in the Occupied Territories" . Retrieved August 13, 2015. ↑ "One place, different memories". Geschichtswerkstatt Europa. 2010. Archived from the original on July 16, 2011. Retrieved July 26, 2012. ↑ "Ausstellung der KZ-Gedenkstätte Dachau". Dachau Concentration Camp Memorial Site (in German). Archived from the original on 18 January 2012. Wachsmann, Nikolaus (2015). KL: A History of the Nazi Concentration Camps. Macmillan. ISBN 978-142994372-7. Wikimedia Commons has media related to Nazi concentration camps .